Experiment with the spray-can! Join our 1.5 hour graffiti lesson, held at an artist studio in Little Haiti, and make your own masterpiece on an individual-sized board. Workshop is conducted by a graffiti artist, there to introduce you to spray paint and to guide you through your art class. You are welcome to bring wine or beer and enjoy it as you paint and socialize. Meet our artist-instructor at his studio in Little Haiti. If you brought wine and beer (so long as you are 21 years or older), we will help you open and it and have cups on hand. We will have easels set up with an individual board, spray paint, and masks. 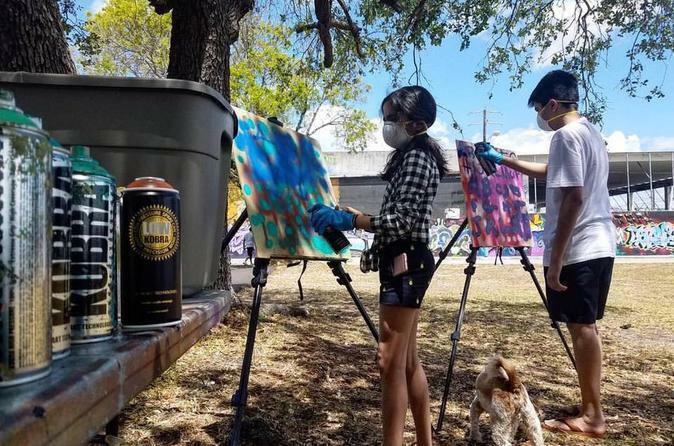 Our artist will explain and demonstrate how spray paint should be used: spray tips, different kinds of lines, blending of colors, writing letters, and more. The artist will guide you, help elements in your work pop, or add elements if you wish as you chat about Wynwood, graffiti and street art, and technique. You will be able to take your piece with you. The workshop will last 1.5 hours.